When autumn and winter seasons seem to appear out of nowhere every year, many people are caught with their lawn tools not ready for storage and their winter power equipment unprepared for the cold and snow. Improperly stored gear often becomes less effective in the spring season, a problem that could easily be prevented with a little preventative maintenance. One of the largest pieces of equipment and one of the most important to fix if a problem occurs is the lawnmower. 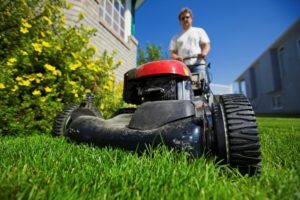 While homeowners need to replace their mowers approximately every six years, that figure could become much more frequent without proper winter storage precautions. Give the mower a thorough cleaning, making sure that all mud, leaves, and debris are removed from the body and the blades. Really work to clean the mowing deck which can become caked with grass clippings and mosses. This process will likely require a strong scraper to pry off the caked bits and a hose to rinse it completely clean. Remove the mowing blade and sharpen it now rather than waiting until one day in the spring when it is time to mow and the blade is too dull. Change the oil in the mower. Be sure to disconnect the spark plug wire, replace the spark plug and add a teaspoon of oil to the spark plug cylinder. Check the air filters, replacing old paper filters or cleaning foam ones. Examine all the belts and gear drives, looking for signs of overuse or the need for lubrication. Make sure all the wheels are sturdy and do not need to be replaced. Use STA-BIL® Rust Stopper to deliver a protective coating on all exposed metals, preventing rust and corrosion. 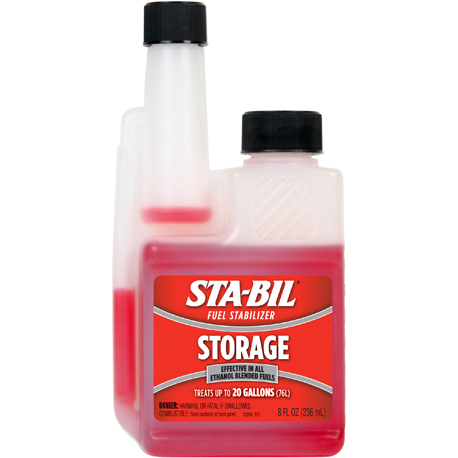 Add STA-BIL ® Fuel Stabilizer to the fuel tank before putting it away to keep the fuel fresh throughout the storage season. Store the mower a safe distance from fertilizers, cleaners, and chemicals that could cause corrosion if in contact with the mower. Whether a garden tiller was recently used to turn over the soil of a completed plot or not used since last spring, care must be given to this equipment that will be one of the first to be enacted in the warm weather. Begin by running the tiller until all the fuel has been used before storing it. Carefully clean the body of the tiller, washing off caked mud and plant pieces. Check the tiller blades, and sharpen or replace them as needed. Make sure that all the nuts and bolts of the equipment are properly tightened, and lubricate connections and levers that should move easily. Check that the tires are properly filled to the optimal weight. Store the tiller in a dry location that is kept under cover and out of the winter weather. After the final grass mowing of the season, it is time to clean up and store string trimmers as well. Proper care for this equipment is somewhat dependent on its type. Electric string trimmers should be checked to ensure that all the fasteners are tight and that all the straps are strong. Unplug these trimmers, and store them in a dry place. Gas-powered string trimmers need to have the spark plugs and filters checked for maintenance or replacement. Then they should be run until the gas runs out before stowing. Check the trimming line to be sure that it is full and wound correctly. It is a good idea to replace the line each year, and this is the perfect time to do it for next year. Clean the string head, and sharpen the string-cutting blade as necessary. Store a string trimmer by hanging it or placing it in a clean, dry location. There are some differing opinions about the best methods for storing fuel. While people are still generally encouraged to run all lawn and power equipment until leftover gas is gone, many people are beginning to investigate the possibility of adding a stabilizer to the fuel instead. With reports that fuel left in the equipment can become oxidized, cause deposits to form in the fuel lines and potentially ruin the entire mechanics of the gear. Adding a stabilizer to the leftover fuel and running the engine for a few minutes has shown success in preventing this oxidation for up to 12 months of fuel storage. This is more than enough time until spring and summer weather comes back around. Although a chainsaw can be run during any season, most are not frequently utilized during the winter months when it can be difficult to access, cut and haul trees or tree branches. If it is a possibility that the chainsaw will be used even during the winter months, there are a few maintenance suggestions that would save a lot of time and money. Instead of using regular fuel, carefully mix high-octane winter fuel and fuel stabilizer to help protect the engine of the chainsaw. Check the spark plug for the proper working condition. Very thoroughly examine the chain for broken links and weaknesses before it becomes time to use it, and the chain breaks or falls off. Always keep an extra chain on hand, as well as a chainsaw lubricant. 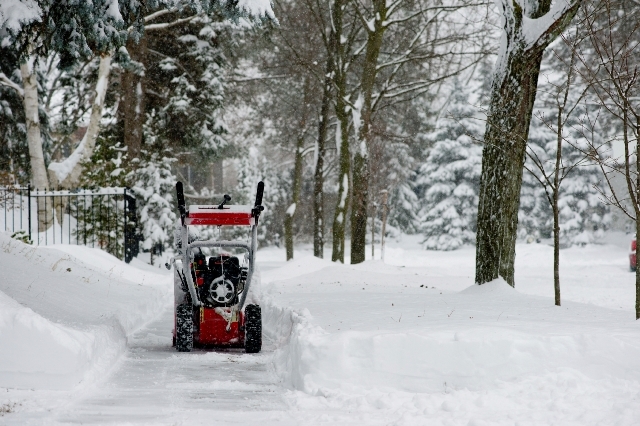 As the most frequently used piece of winter power equipment, it is imperative that the snowblower is in perfect working order when winter begins. Follow many of the same provisions suggested for a lawnmower or string trimmer to get the snowblower in good working order before the first big snowfall. Test the equipment before the first snow of the season. Keep spare parts, such as shear pins, a drive belt, and bolts or clips, on hand throughout the winter season. Driveways that cannot be cleared because of a faulty snowblower will make it difficult to go get help or supplies. It will pay off to do all the repairs and preparations before the start of winter, both for spring and summer equipment and for those pieces that will be needed during the snowy months. Keep power equipment safe and working with these simple ideas.